This unique anthology of poetry written by women in Ireland 1870-1970 includes more than one hundred and eighty poems by fifteen women of diverse backgrounds, experiences and creative aims. Challenging the assumption that little poetry of note was written by women during the period, this rich and original collection reveals the range of their achievement and the lasting value of their work. Some of these women were prolific writers in many genres, others wrote poetry for a brief period only: all produced imaginative and memorable work that sheds new light both on the lives of women and on the development of poetry in Ireland from the late nineteenth century onward. The poetry in this anthology reflects the political and social crosscurrents of the time—the divided loyalties, spiritual questioning and intellectual curiosity that shaped these women’s lives. There are personal concerns too, and a desire to combine the expression of feeling with attention to the craft of poetry itself. Some of these voices will already be known to readers: poets such as Katharine Tynan and Eva Gore-Booth were widely published during their lifetimes and have been regularly anthologised in the years since. Others will be discovered here for the first time, offering fresh insights into the inventive and forward-looking work of these women. From the nationalist ballads of Elizabeth Varian to the modernist lyrics of Sheila Wingfield, these poems show the range and accomplishment of poetry written by women in Ireland between 1870 and 1970. 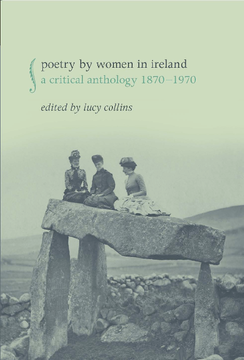 Lucy Collins is Lecturer at University College Dublin and the editor of 'Poetry by Women in Ireland: A Critical Anthology 1870–1970' (Liverpool University Press, 2012).